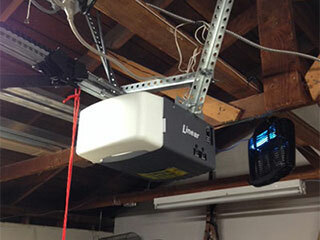 Electro-mechanical devices as complex as your garage door opener are bound to fail sooner or later. Our skilled technicians are well-trained and experienced enough to effectively repair units from all major brands. Let us help you prevent mishaps and potential accidents that a malfunctioning unit could cause. Openers can be categorized by the kind of drive systems they use. Those can be divided into three different types. A belt-drive is a good option if you seek excellent performance with near-to silent operation. Screw-drive units can make quite a racket and are also affected by temperature shifts, but are great if you're looking for an option that requires very little maintenance. Chain drive models are known for being reliable, and are an excellent and very affordable choice, if you don’t mind the noise. The new opener models that are available today come with a variety of advanced technological capabilities. Branded rolling code applications, like the Genie Intellicode and the LiftMaster Security Plus are excellent examples of this. WiFi compatibility, backup power systems, and a load of other features are all something you should consider before you decide on a purchase. We are your local experts for all the major brands, and we're happy to answer any questions you have or to offer you advice when you need it. Treating your opener to a regular maintenance schedule will ensure longevity and problem-free performance. Our fully qualified technicians can troubleshoot your entire unit, carry out safety sensor testing and, when necessary, replace or repair faulty parts, like the motor gear and the circuit board, for example. Joining our regular maintenance services will ensure you'll get the best out of your opener for many years to come. Our experts at Garage Door Repair Murrieta, are the best service specialists around. If you're considering the purchase of a new opener, have any questions regarding installation or repairs, or if you're interested in setting up a regular maintenance schedule, we're the best team to call. So why wait? Get in touch with us today and find out what we can do for you.